In response, my friend Epcot Explorer commented that as great as the photo is, it's unfortunate that you can see the show building. My response was the same it usually is when people make this comment: Why do you care? This led off on a long discussion about show buildings, their ways and doings. Eventually it led to this post. Now, to me, show buildings - those large featureless warehouses which house the Disney attractions - are a way of life, and I have accepted them as features of the Magic Kingdom. They're there at Disneyland -- for generations guests have entered Disneyland by walking past them - but in Florida, for better or worse, they're more conspicuous by nature of the park's very wide walkways and less mature foliage. If Disneyland were laid out the way Magic Kingdom is, there'd be show buildings poking out all over the place. Even when I was a kid I knew about this one, and yes, it is ugly. I didn't actually realize what it is until I was an adult, however, and that's a point I'll return to shortly. It's very true that compared to Disneyland, Magic Kingdom has more places where the fact that you're walking the perimeter of blocks of huge warehouses, especially on the East side of the park where foliage and textured architecture is less common, is evident. This, of course, makes Magic Kingdom an ideal place to engage the "show building question". Tokyo Disneyland is actually the most ideal place, but I haven't got a plane ticket to Japan in my itinerary anytime soon. This photo makes it look way worse than it does in person. The eye is naturally drawn towards complex shapes and patterns and away from plain surfaces, so I guarantee you very very few people ever notice just how stark that covered area is. It's tucked way back at the end of the street where you'd have to go looking for it. You can't even see that one from ground level, you have to go up the train station and look past all that beautiful architecture and two huge trees. But it's there, hidden in plain sight. This is a good moment to observe how the effect is supposed to work: painted a neutral shade of green or brown, the eye simply doesn't bother to differentiate a plain wall from the sky or some other vague backdrop we tend to overlook. The eye just slides right over it. 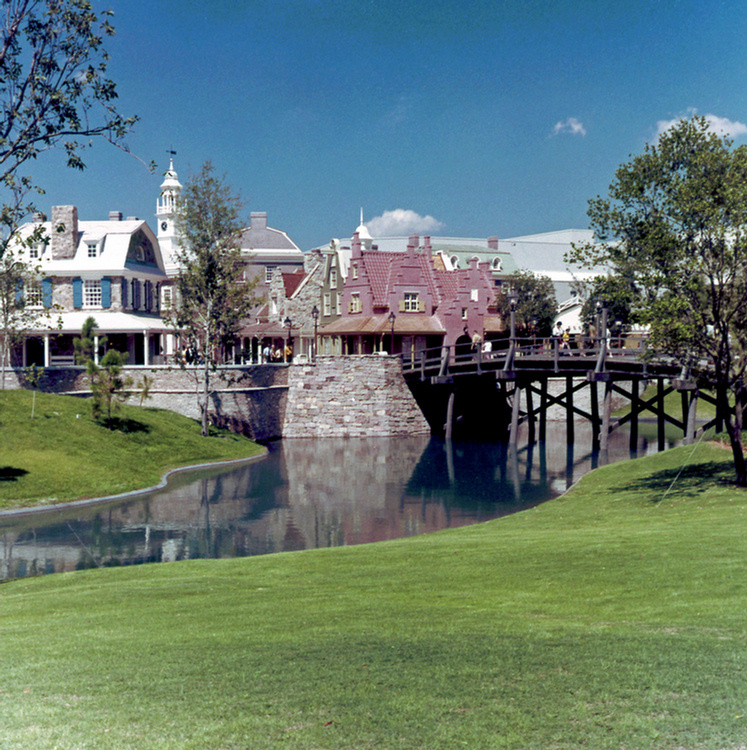 Obviously those thin trees and grassy hill were supposed to grow in and disguise the show building on the right, but that it didn't last long enough to end up happening that way. The Tudor-style building went up in 1973 to house the Fantasyland Portrait Artists. Looks pretty good, right? That really does look like part of a castle. That stonework looks pretty good, but those banners were put in to distract your eye away from the unthemed rear wall, which to me indicates that WED knew they had a problem with the central courtyard. Also please note that until recently, this view was impossible, but as part of the Fantasyland Expansion, Imagineering removed a good number of spreading trees from the area around the Carrousel (why?). Here's where it gets sort of brilliant: directly below that visible gap, inside the seating area, is a window looking out directly on -- a blank wall. How many times have you seen this without really seeing it? I find this another completely forgivable one. Imagineering calls these colors "Go Away Green" and "Look Away Gray", and they are specially mixed to strike our brains as being, literally, nothing worth looking at. But here's the thing, and this is where my point begins: WHY are you looking to the left?? Have you seen what's off there to the right??? Why are you spending time looking at an ugly flat wall? Nobody else is, why should you? It's time to talk about magic, and no, I don't mean Disney Magic®, I mean stage magic. What is stage magic? I'm sure none of you are under any real life belief that the magic hat really is empty, right? What is magic? It's misdirection. Penn and Teller define misdirection as knocking over the scenery on stage left while the Amazing Vanishing Duck is yanked offstage to stage right. Of course, if you don't look stage left, the illusion is ruined. But if you aren't willing to go along with the illusion, why are you there in the first place? Disney is magic in the sense that we pay good money to believe that impossible things can happen. Some of the illusions of creaky, but we love them anyway not because they're perfect, but because they're fun. I very much believe this is the attitude WED Enterprises took to their show buildings: a quite necessary but forgivable offense, and I'm pretty sure they were following Walt Disney's lead. More recent generations of Imagineers have been far less confident. In the early 90s, a number of clever (and not so clever) techniques were employed at Disneyland Paris to hide show buildings, and many of these were then brought back over to Disneyland in the same decade. As a result it's much more difficult to find the seams at Disneyland; they've been papered over with props, gates, trees and other visual obstructions. I wish I still had available to post here a certain great vintage photo of the New Orleans Square train station; you can see right where the theming terminated in a stark blank wall. This was during Walt's time. 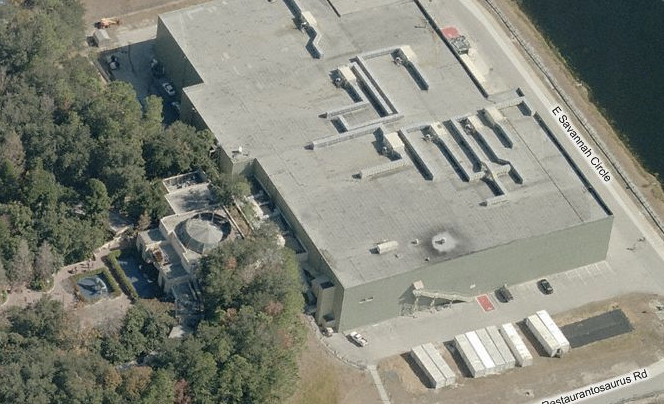 It's true that recent Imagineering is much more likely to thoroughly hide show buildings - a great example, also at Walt Disney World, is Dinosaur/Countdown to Extinction at Animal Kingdom. The berm that hides the connection between the facade and show building is sufficiently convincing that you never even think to ask where the rest of the ride is. That's a good illusion, and there's ones just like it in modern, more sophisticated theme parks like Islands of Adventure and Tokyo DisneySEA. It's true: modern theme parks and designs teach us to view show buildings as liabilities. But, you know, it's one thing to build your attraction so that your show building is impossible to see, and it's another to build your attraction with a show building that nobody ever sees. The public isn't stupid; they don't think the animals on the Jungle Cruise are real, but the simple fact is that there are tens of thousands of people roaming around the Magic Kingdom daily who never see any of these massive gray warehouses. Let's be honest: if you're on this blog and reading this now, you are not the general public, you are a specialist. This is written for an erudite, sophisticated, and moreover, acclimated audience of theme park goers who are inevitably a bit jaded. To us, we notice these things more. We dwell on them. They're imperfections in an otherwise perfect world. Theme parks, after all, rely on novelty and surprise to maintain their illusions. If you're like me and you've been to the Magic Kingdom hundreds of times and crawled through most of its' innards, we're less likely to look at that castle. We are more likely to be bothered by obvious show buildings. But I don't want you to see these things as liabilities, I want you to see them as badges of merit. Next time you're at Enchanted Grove, stand there for twenty minutes and watch everyone not seeing the huge blank wall above their heads. Marvel that the illusion still works. That's it, that's your proof right there of the staying power of the theme parks: there can be huge seams showing - vast expanses of unthemed infrastructure - and everyone looks away just as the designers intended. It's real magic. Disney goes to great lengths to conceal their men behind the curtains. The ghosts in the Haunted Mansion are real. If there's Pirates, you must have gone back in time. The rain in the Tiki Room may just be from a recycled faucet, but it continues to enchant and perplex. But just because we know the man is there behind the curtain, that doesn't mean we can't enjoy the theatrics anyway. Sometimes, the most remarkable trickery sits right out there in plain sight waiting to be discovered. Brilliant work, as always. Yes, we can become jaded and a bit disillusioned, but as you say, par for the course, and yet another level of theme park design theory to pursue. I am very much amused in you choosing the Main Street East facades, here. I've always liked the Center Street gate for the reason of how well its hidden. People are drawn down the street, but never make it to the terminus. They seem to hover by the last shop door and usually just look up at the ART FESTIVAL sign. (Which is a nice call back to when Center Street had a bit more purpose!) Funnily enough, there are a gaggle of chairs and tables down there, but they are rarely used. They make for a very calm respite against the bustle of MSUSA. Also: YES to wondering why in the world people look at the unhidden parts of Main Street above The Plaza. It ALWAYS catches my eye... and yet, there's a gem of a vista if you just look right. The hub, a iconic castle, trees, water... Pure Vacation Kingdom! But, no, people see the gray! Once again your article has caused me to reexamine the way I think about the parks. Well done! 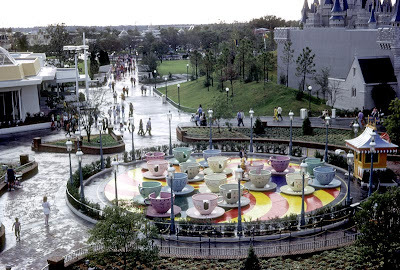 Not to mention all the eyesores you could see from aerial rides over the years. At DL there was always a fine view of air conditioning units from the Skyways, to say nothing of the views from the Peoplemover and the Monorail. I've always thought that the reason why the Magic Kingdom (and the other WDW parks) had the problems you're writing about was simply because they made the parks so large. It was, to me, like what happens when you take a detailed line drawing and blow it up on a xerox machine. All the detail is still there, but there's a lot more white space and it doesn't look quite as good. With just about every other Disney park in the world being smaller in size than the ones at WDW, it's easier to hide those massive show buildings from inside the parks. They just design the facades facing inwards and put the show buildings where no one is ever going to go. The Paris Haunted Mansion (and Pirates!) is like that. Or, in the case of Tokyo, they make the show building part of the theming, like their Star Tours building or the combo of Journey to the Center of the Earth and 20,000 Leagues. When you're walking into Mysterious Island, the entire volcano area is the show building. While I want every show building possible to be hidden, you're completely correct. It wasn't until I became a Butler that I noticed the Mansion show building, after two decades of visiting the place. It wasn't until someone pointed it out to me that I ever saw the massive Soarin' show building. It wasn't until the Internet started complaining about it that I ever noticed the Dumbo queue. Unfortunately, now I can't un-see all these things, but I'm not the target audience. I'm the 1% (or whatever) that sees this crap and cares, whereas everyone else wanders by looking at the good stuff. Oh Foxxfur, this is the kind of article that I love the most. Although I have a deep love of WDW, I don't get to go very often, and have never had the kind of visit where I could just stroll around and observe. For me and so many others who have to make the most out of their quickly-passing hours in the parks, you are our eyes and ears, stopping to linger and reflect. I have to admit I have rarely noticed any show buildings at the Magic Kingdom. 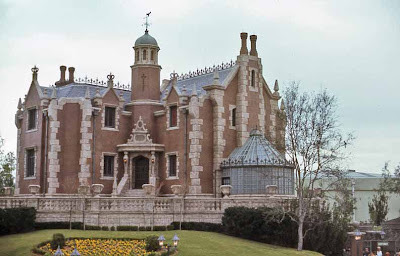 Part of the magic of being a child at the park is believing that the Haunted Mansion ride really fits in that old house, as I totally did. I love the TTA (WEDway) but maybe my love for the park is so great that I blot out any undesirable views, or I am so thrilled to be zooming along that any imperfections go unnoticed. I wish your post had included which attractions' show buildings were being shown, as I could not figure it out. I know your blog is not about Universal Studios, but it would be interesting to see a comparison on how they hide their show buildings. I heard they had trouble recently when the expanded the queue to the big Harry Potter ride and suddenly there was an unfinished side of Hogwart's Castle exposed to view. I wonder if they have tried to fix that or are content to let the illusion lapse. Thank you, thank you, thank you for your amazing articles. So many Disney books I have read leave me unsatisfied, but your passion for the subject always delights and informs. 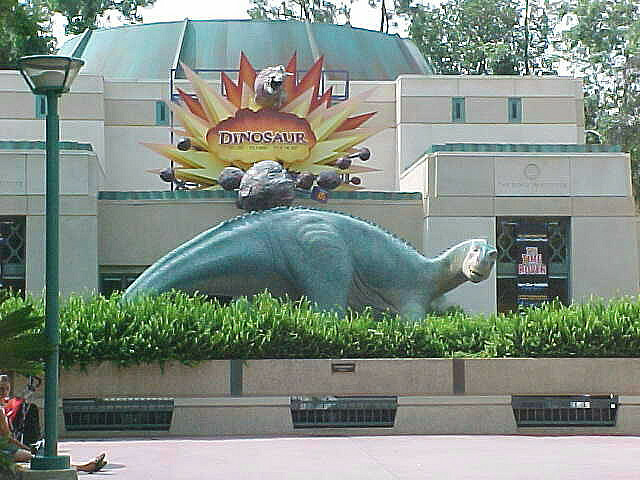 Then, Imagineering built an entire park of unthemed show buildings. And MGM Studios was born. I think I've always been able to tolerate a small bit if visible unthemed structures or the minor reveals of backstage at Walt Disney World. The Hall of Presidents show building however is another story. That massive structure was like a giant rectangular Space Mountain dropped behind the streets of Liberty Square! 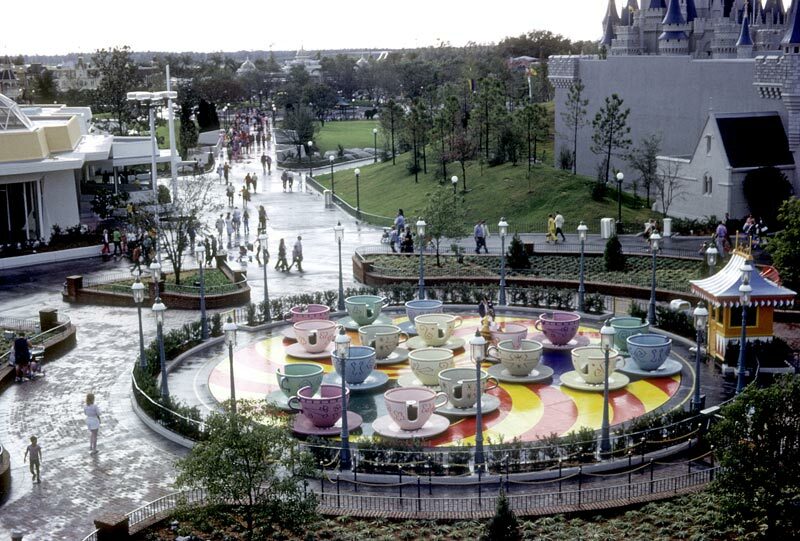 I remember in the 70's as a kid hearing people comment about it on the Liberty Square Riverboats!!! Having worked on many of the models for Shanghai Disneyland not to long ago, this is still a problem: Giant show building visible throughout Fantasyland, as well as Tomorrowland show buildings visible from Fantasyland and a problem: the tops of some special effects tunnel buildings of the Fantasyland Boat waterways are all visible to guests dining or visiting inside the Princes Castle. Over time some vegetation will hide this, but not as much as it should. Fantastic article as always. I think you struck just the right note about the evolution of show buildings and their use, but I have something that has been bothering me since my first visit in 1979. Even at that impressionable age of "soaking it all in," I found it odd (and still do to this day) that the 1979 Park Map of the Magic Kingdom OUTLINES every show building including the Haunted Mansion with each of it's angular twists and turns. It just seems pointless to show such detail to a Guest on a map in those early days of the Park...but if you look up that very map, it's right there. It's like the S.E.P. field from the Hitchhiker's Guide to the Galaxy books. "But if you aren't willing to go along with the illusion, why are you there in the first place?" Exactly! That's why it always bothers me to hear parents telling wary children, "It's not real, it's just pretend, it's like the movies," etc. Way to harsh my willing suspension of disbelief, and prime your kids for a lifetime of not truly appreciating art. Recently the Haunted Mansion show building has been painted a dull green due to the recent Fantasyland expansion. Before that it was white, just like in the photos on your post. Like everyone has said so far, creative solutions must be used to hide an unimpressive warehouse, that is until Imagineering can invent invisible paint. I'm part of the 99% which did not consciously notice any of these things -- also probably because the illusion is not as well mantained in parks other than Disney's and I don't live in the US (been DisneyLand and DisneyWorld just once each - more than 10 years ago). Can't say I fit into either of the demographics described in your post, having followed an RT by the good man Cory Doctorow, but this actually interests me quite a bit - as a programmer by hobby, I actually do like identifying the underlying structures of things, and this has given me something more to do in a theme park I would otherwise likely be bored by. Thanks! For some reason even though I can sometimes see the show buildings, I have no problem with believing the story. I believe the Haunted Mansion fits in the house just as I believe that sitting in a darkened theater can fly me away to literally anywhere. Whether that means I am rather childish, or that I simply have a strong will of imagination, I cant say. I do know that it makes things far more enjoyable in life....at least for me! I found out what that section of main street ("I didn't actually realize what it is until I was an adult") during a Keys to the Kingdom tour in 2007. The *worst* show building is Soarin' in EPCOT, which is very easily seen from almost every nation in World Showcase, and no amount of Go Away Gray can make it go away (especially in pictures). I'm not sure that anything can be done about that. The building's height is a necessary requirement due to the nature of the attraction, but there's no way the trees in Florida will ever grow enough to block it. Then again, EPCOT has worse problems, given how obnoxiously Swan and Dolphin can be seen throughout the whole park, totally ruining the effects of the Eiffel Tower and Big Ben in the French and British exhibits respectively. There's a reason no Disney-owned resort is above 5 stories tall except the Contemporary, and even there, the way the Hub is arranged, one can only see the Contemporary when one is in, or looking through, Tomorrowland where the hotel fits in perfectly, one of those cases where the hotel and the theming and the desire to hold the lands of the Magic Kingdom intact actually really worked. Fantastic article! Misdirection is, indeed, part of the magic of the Disney parks. If we can choose to ignore the sight of emergency EXIT doors in Haunted Mansion and Pirates of the Caribbean, we can certainly choose to not let a show building's presence interrupt the story! Amen! The whole illusion of it and how they pull it off is a big part of the fascination, for me anyway. When I discovered aerial maps, WDW was one of the first things I looked at and I was hooked - and amazed and intrigued and surprised at what I saw was there, but my mind never wondered about from the ground. It is striking to see a circa 1970's photo - how bare things look - and compare it to current day. My, my! We're the Imagineers really that smart to plant that tree in just the right place and wait 20 years for it to do it's job of camouflaging? Maybe. Still, I fell for the illusion. I didn't notice that blank wall because there's so many more interesting things that grab you by the shoulders and say, "Look here! look at me!" I looked this post up during a conversation about go away green with a friend. As I was rereading I had the realization that the best camouflage-by-not-camouflaging of a show building has to be Spaceship Earth. Seeing the show building is the entire point!